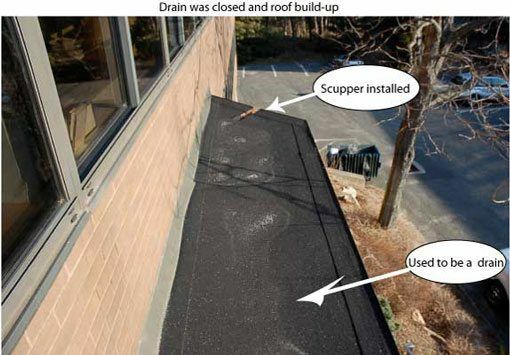 Scuppers are the most efficient means of removing water from flat roofs – living in Fairfield County, Westport, Greenwich, and Stamford, we get our fair share of rain. It is important to make sure that drains are well positioned and function properly. We do all kinds of flat roof repairs that includes scuppers, drains, and gutters. Our expertise comes from fixing other roofers jobs. So often we will see a new roof installed but the technique is not what it suppose to be. The common problem most roofers have with installing roofs is making a transition to flashing. That’s where most roofs fail. Almost everyone can lay down a rubber roof on a flat surface, but when they have to tie it to metal edging or flashing, then everyone has different ideas. 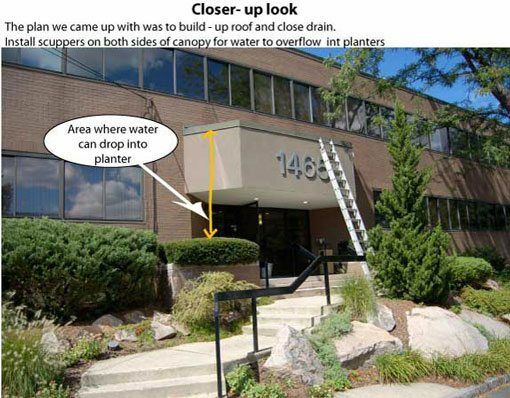 Flat Roof Repairs – The water used to flow over the edges unto the stairs. This made the stairs very slippery during winter. We installed a rubber roof over tar and gravel and eliminated the drain. Then we installed a scupper instead and water was draining off the flat roof. 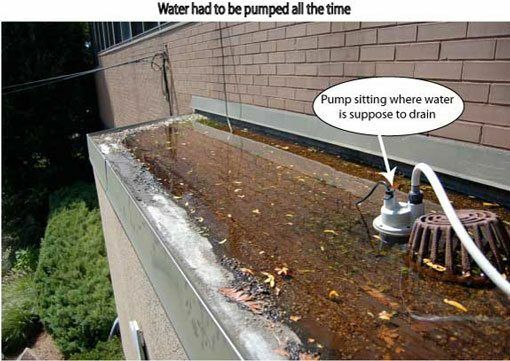 There was a pump installed on the roof to get rid of the water. Funny. When designing a roof the most important aspect is to make it maintenance free. Drains are always the opposite. Someone installed a pump to drain the water from the roof. Drains get clogged and to maintain them is costly. Instead of a drain, we decided to install a roof scuppers on each side of the roof. This way water could always run off into the flower bed beneath. No more drain clogging. This shows where the water would fall into the roof. 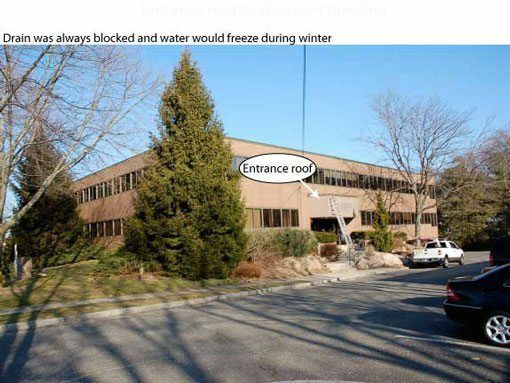 Draining water off a roof has to be away from walkways and entrances. We installed a rubber roof over the stone and created scuppers. This is what the scuppers look like on a roof. They can vary in sizes but for a small roof like this, it was not necessary to make big scuppers. A closeup look of the scupper. 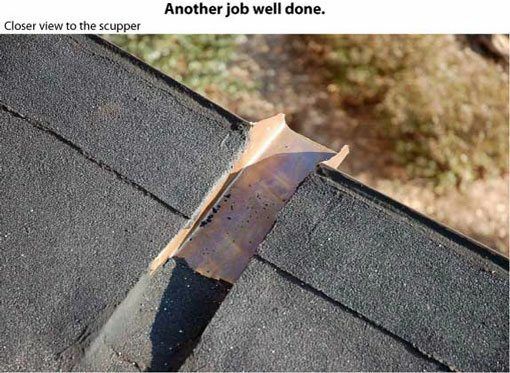 This is a very inexpensive way to drain water off a roof. your web site by accident, and I’m stunned why this accident did not took place in advance!